On Saturday the No. 10/10 Harvard Crimson travel to Hamden to face the No. 7/8 Quinnipiac Bobcats. Ted Donato's team is off to a 4-0-1 start (they won at Princeton on Friday) but two of those wins were against a second year Division I team in Arizona State both blowout wins out in Arizona. 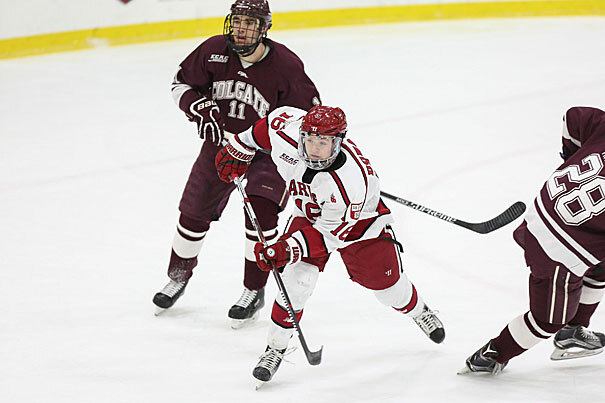 Returning from out west, Harvard opened ECAC play last weekend with a 1-1 tie against Colgate a team picked towards the bottom of the ECAC and beat rival Cornell 4-3 the next night. The Crimson are coming off consecutive trips to the NCAA tournament but have not won an NCAA tournament game since 1994. They were swept a season ago by the Bobcats in the regular season. Harvard lost 97 points between the loses of a trio of senior forwards in Jimmy Vesey, Kyle Criscuolo and Colin Blackwell but already they are the top scoring team in the country at 4.50 goals per game tied with Lake Superior State. They still return some fire power up front led by sophomore Ryan Donato (2014 2nd round, Boston) who has four goals and four assists. Senior forwards Luke Esposito (2 goals and 4 assists) and Tyler Moy (2015 6th Round, Nashville) (3 goals and 4 assists) both are tied with Donato for the team lead in scoring. Sophomore Lewis Zerter-Gossage leads the team in goals with five (7 total points) and senior Sean Malone (2013 6th round, Buffalo) (2 goals and 4 assists) round out the top forwards for Harvard. 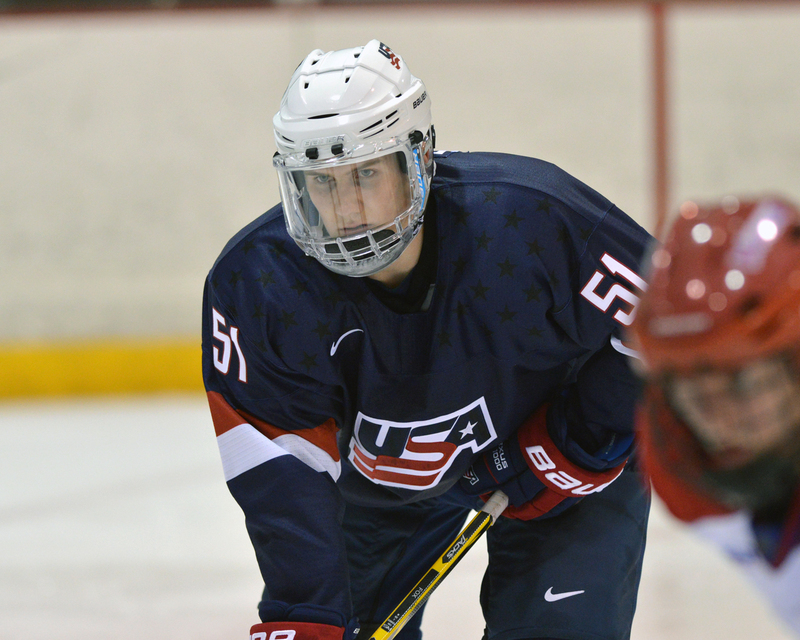 Freshman defenseman Adam Fox (2016 3rd round, Calgary) has six assists from the blue line. It's not the biggest team up front with similar size players to Quinnipiac's roster but it has some very good talent and speed. The Crimson have the 7th best power play in the country at 25.71% converting on 7 of 27 chances. It is key that Quinnipiac stays disciplined in this game and not take penalties in order keep the strong Harvard power play off the ice. Harvard has some very talented players on defense led by two freshman studs in Fox and John Marino (2015 5th round, Edmonton). Fox is a shorter defenseman but is a tremendous passer hence the six assists he already has. He is not overly physical and isn't the most elite skater but he makes up for that lack of quickness with his passing ability from the blue line. Marino brings some size from the blue line along with someone who is mobile and good in transition. Junior Wiley Sherman (2013 5th round, Boston) brings enormous size with his 6'7, 200 lb frame. Harvard looks to be dressing seven defenders a night in their first four games of the season so far with sophomore Viktor Dombrovskiy, senior Clay Anderson, junior Jake Horton (playing up at forward) and sophomore Jacob Olson all seeing action in three or more games. They are another good defensive team as they are 3rd in the country in defense at 1.50 goals per game but two of the games were against Arizona State which doesn't have a lot of talent at this point in their Division I existence. The Harvard penalty kill is off to an uneven start as they area 40th in the country at 83.3% (30-of-36). Quinnipiac has struggled on the power play so they might have a good opportunity to improve upon it against the Crimson. One thing the Crimson do well is score shorthanded goals as they already have three of them in four games this year. 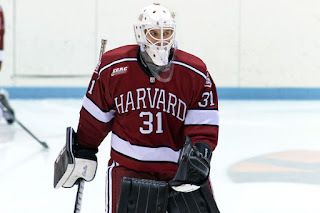 Harvard has also gotten outstanding play from junior goaltender Merrick Madsen (2013 6th round, Philadelphia). In four games played this season, Madsen has a 4-0-1 record with a 1.57 goals against average and .931 save percentage with 1 shutout. He is coming off a very good sophomore season in which he went 18-7-3 with a 2.00 goals against average and a .931 save percentage. It will be a challenge getting pucks behind the 6'5 Madsen. Last year the Bobcats did not face Madsen. Both of Harvard's losses to Quinnipiac were started by current sophomore Michael Lackey. I would expect Madsen gets the start especially when Lackey gave up nine goals to the Bobcats in his two games against them a season ago. Getting traffic in front of Madsen will be key especially with his height and ability to see the puck. Both Quinnipiac and Harvard are expected to challenge for the regular season crown in the ECAC so Saturday's match-up should be a good test between two very good teams. Harvard last won at High Point Solutions Arena back in the 2014-15 season when they won 5-2 in a penalty infested game.